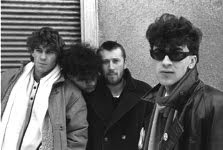 This entry was posted on February 17, 2010 at 9:11 pm and is filed under 1980s, 1986, darkwave, dobri isak, lo-fi, post-punk, serbian . You can follow any responses to this entry through the RSS 2.0 feed You can leave a response, or trackback from your own site. Hi, the track "Nepoznata" (trans. "Unknown track") is NOT a hidden track. The guy who ripped the tape added it to the rip. The song is actually called "Helen Keller" and it appeared as a bonus track on the PMK rerelease. YES I HAVE THIS ''TAPE'' TOO AND IS THE SAME EX-TRA TRACK,I BELIEVE AS WAS TOTATALLY INTENTIONAL,OW A DAY OR THE LAST YEAR APPEAR IN CD X FIRST TIME,I HAVE IT TOO. THE CD FORMAT IT'S INCREDIBLE. This album is so good! Thank you. does someone have an english translation of the lyrics?